Many of us struggle from an unconscious drive to control our emotions, our surroundings, and the people in our lives. We learned to do this because at some point in our lives doing it kept us safe. However, once the crisis is gone, we need to break this pattern of behavior and free ourselves. Managing life through controlling our emotions, actions, environment and even trying to control other peoples’ actions or emotions is taxing on the body and soul. It is truly exhausting. Take a moment and draw a deep slow breath in…and out. Close your eyes and imagine a leaf riding a wind current. Watch it drift along, floating up…down, floating peacefully through the air without resistance to its next destination. Take another deep breath and imagine you are the leaf, let go of control and float for a few minutes. Breaking this pattern can be difficult so take some time and reflect on one or two areas of your life that you can begin to allow yourself to surrender to the wind, surrender to the world instead of trying to control your ride. Maybe it is making dinner, cleaning the kitchen, or your afternoon commute. Or maybe it is an argument with your spouse or child. Surrender to the flow of life, let go of your predetermined objective or outcome and see where the wind takes you. 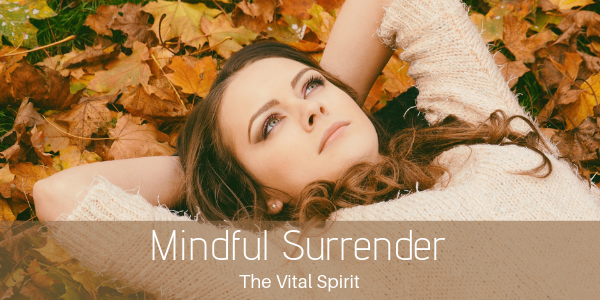 Mindful surrender can increase your health; physical, mental, emotional, and spiritual. Surrender allows you to be more fully in the present moment, so you can respond to life instead of reacting to it. For some surrender can feel like defeat, it isn’t. That is our ego talking, trying to protect us, breath through that resistant thought and see how it feels to ride the wind for a while.